Part of the problem is the focus in the coverage on the issue of “self bonding,” in which mining companies basically promise they have the money available for cleanups, rather than actually posting insurance bonds that would fund reclamation if they went belly up. The real issue in my mind is less self bonding, and more the simple nature of states being allowed to run permit programs based on bond “pools.” Rather than requiring full-cost bonds — surety of some sort to cover the actual projected reclamation costs — companies pay a per-acre bond that goes into a common pool. It’s no surprise to readers of this blog that the per-acre bonds never covered the actual reclamation costs, let alone long-term water treatment. And for many, many — many — years, environmental and citizen groups like the West Virginia Highlands Conservancy have been preaching that the bond pools (like West Virginia’s Special Reclamation Fund) didn’t have enough money — and would literally collapse if there were a collection of serious coal company bankrupties. In West Virginia, state regulators have never forced mine operators to post bonds or otherwise obtain insurance that would cover the full cost of land reclamation or water treatment at their mines. Instead, operators post bonds in smaller amounts, or they “self bond” by showing regulators they are financially healthy. 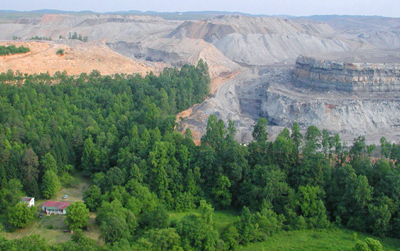 A “bond pool” or “special reclamation fund,” which also includes money from a reclamation tax on all mine operators, is used by Department of Environmental Protection’s Office of Special Reclamation to clean up mine sites that are abandoned since passage of the 1977 federal strip-mining law. That bond pool itself has, for years, struggled with maintaining enough funds to pay to clean up mines left to the state’s supervision when companies go belly-up. Moving forward, it’s going to take a lot of work from smart people to find ways out of this mess — but one thing that is important in solving this and so many other coalfield issues is being honest about how the problems came to be. It’s not just cleanup, but also consider mitigation. In order to get a Clean Water Act Section 404 permit, coal companies must promise to perform mitigation for impacts to waters of the US. This mitigation takes on many forms, but the bottom line is that it costs lots of money; generally on and order of hundreds of thousands of dollars or more. Currently the Corps does not require any form of bonding for mitigation projects and these projects can be as far into the future as 30 years. Although pledging “financial assurance” is a condition of receiving the permit, my guess is, that if the company doesn’t survive bankruptcy, the Corps would have to “get in line” with all of others trying to recover monies. The have always said that coal is a cheap fuel needed for cheap electricity, but coal is not cheap. It has kept it price down by not paying the cost of “externalities” and leaving the waste and destruction of their mining, preparation plants (think MCMH) and transportation (coal trucks destroying the roads) to be paid for by the public or just lived with by the people. This is real funny. Work and work to put a coal company out of business and then cry about the mess that is left. I suppose there is plenty of blame to spread from every side. But, let us not forget (over the years) how many tax dollars were raised for roads and schools all over the state from coal that was mined in southern WV counties. Now that this revenue is gone and probably never to return we focus our sights, hopes and prayers on some really smart people to get us out of this mess. The legislature wants to raise smokes sixty five cents a pack to limp us by a while, so not to drain the rainy day fund too quickly, and every struggling small town and community is trying to come up with a catchy touristy way to draw more dollars their way in hopes of just keeping what they have going. People, we haven’t even seen bad yet! Steve’s right. Taxes collected from coal have dropped dramatically, and we haven’t seen the worst of it yet. Our state budget woes will get much worse before they get better. Loss of coal severance taxes has been a big problem, but the next shoe to drop will be devaluation of coal left in the ground. I once worked in the state tax department valuing coal properties, based on the amount of coal remaining underground, and projected future production. Past predictions of future production are no longer valid. The coal properties are truly not worth very much anymore, and to be fair, the property taxes on them will be revised downward. These property taxes are shared with county and local governments, so devaluing coal properties will cause our schools to suffer, local police will be laid off, etc. As coal companies go bankrupt, we will all feel the pain. So, what to do? For starters, why not get Washington to release all the Abandoned Mines Funds that is supposed to come here, so we can begin the rebuilding process? Absolutely Lew…Much of the WV’s wealth has gone out of state while we are left to cleanup the mess. Let Washington and the other states pump money back into WV in the form of Abandoned Mine Cleanup and New Mine Reclamation. It may not be a long-term economy like coal was (eventually the amount of cleanup will dwindle and jobs will dry up), but there are tons of abandoned sites that will require years of work and need continual maintenance and upkeep. That will buy us some time to get ready to live without coal being a dominant source of revenue in this state.